Issues. Problems. Push back. Trouble. No matter what you call it, conflict arises in many of life's situations. In my childhood, I was adept at causing conflict. Whether that conflict was with my parents, brother, or caused out with my friends, didn't matter. I was good at causing it. In many instances the conflict was nothing more than me running my mouth in direct opposition to whatever will was trying to be imposed on me. Never anything much that couldn't be cure with an "I'm sorry." However, my real hard knocks introduction to the topic of conflict management came down Bookwalter Drive one summer in the form of three kids a few years my elder and a red aluminum baseball bat. I'll relay this story in PG language for the more conservative readers out there. While I was about 12 at the time, the exchanges were certainly rated R. Anywhere the speech feels awkward, it’s because a soft word has replaced a profanity. I still cannot to this day remember when I ran my mouth at those kids. Nor have I shared this story much lest someone uncover the groveling and tears that led up to the denouement. Regardless, walking home from a friend’s house, I round the corner from Carmen to Bookwalter. There were no iPods or affordable cell phones at this point, nor did I have a Walkman yet, so my hearing was in no way impaired. I distinctly saw these three much bigger kids, made eye contact, then the one in the middle pointed the bat at me and said, "Hey, it's that mouthy boy from the other day. Get him!" I froze. Coincidentally, this was the first time I experienced the lag in one's flight or fight responses. The delay was enough to let the skinniest boy grab me and pin my arms behind me. He held me there while the one with the bat, a blonde, freckled kid, approached to say, "Who's the boy now, fella." I'd like to say I was heroic. But I was panicked. I tried commanding them to let me go, threatening to call the cops, and just plain struggling. It didn't work. They just laughed. The third boy kicked me in the leg and punched me in the arm. I started crying. I apologized. I promised to be nice. Bat kid just said, "You really are the boy now. Arentcha? Hold him there." He drew back the bat into an off-center stance. This exchange had probably lasted 45 seconds. While it felt much longer, not much else in my life has felt longer than waiting for his shoulder to lurch forward. I envisioned myself battered and beaten. Much like the guy at the end of Robert De Niro's enthusiasms speech in the movie "Untouchables." Except the panic had subsided due to the adrenaline kicking in. When his shoulder twitched, I stepped forward fast. This left Skinny on the receiving end on the bat's barrel. Blondie’s wrists snapped into the upper part of my rib cage and the bat came to rest snugly under my armpit. I swiveled to the right with the bat and slid to a more adjudicated position. The bat dropped cleanly into my grip. I raised it above my head screaming, "You boys are freaked now." They ran. My hands shook a bit. Then I walked home with my new bat. Usually a victory doesn't solidify a story’s morale quite as well as a loss. If you are expecting the morale of the story to be that I learned to hold my tongue, you’d be quite wrong. 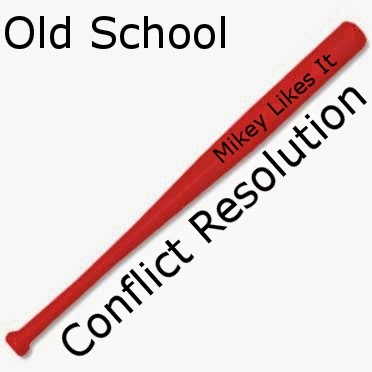 However, I certainly learned a few valuable lessons about conflict and its resolution. I’ll name several, but I don’t want to get all Art of War on you. Conflict can come at any time. Your typical resolution methods may not work, be willing to append them to the situation. If you get the sense that the person you are in conflict with may want nothing more than to watch you lose something, take the smallest hit possible, and exit promptly. Staying calm is absolutely required. Knocking those in conflict off balance may tilt the situation in your favor. Just because you are outnumbered, have a poor position, and are out gunned (hopefully metaphorically), does not mean that given the right moment the situation won’t turn in your favor.